Designed as a self-study guide, the book describes the real-world tradeoffs encountered in building a production-quality, platform-retargetable compiler. The authors examine the implementation of lcc, a production-quality, research-oriented retargetable compiler, designed at AT&T Bell Laboratories for the ANSI C programming language. The authors' innovative approach-a "literate program" that intermingles the text with the source code-uses a line-by-line explanation of the code to demonstrate how lcc is built. Recognizing Character Constants and Strings. 13. Structuring the Code Generator. Organization of the Code Generator. Generating Code to Copy Blocks. 14. Selecting and Emitting instructions. 16. Generating MIPS R3000 Code. Since 1975, Christopher W. Fraser has researched compiling, particularly producing code generators automatically from compact specs, and has published many technical articles in this area. He originated retargetable peephole optimization, which GCC, a popular C compiler, uses to help select instructions. From 1977 until 1986, Fraser taught computer science, including compiling, at the University of Arizona. Since 1986, Fraser has conducted computing research at AT&T Bell Laboratories in Murray Hill, New Jersey. David R. Hanson is a Professor of Computer Science at Princeton University with more than 20 years of research experience in programming languages. He has conducted research in conjunction with Bell Laboratories and is the co-author of lcc, a production quality, research compiler for the C language that is popular with the Unix community. 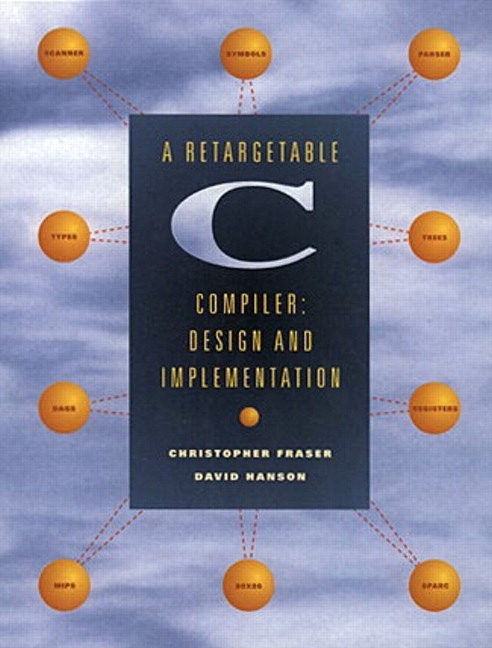 lcc is presented and analyzed in the book A Retargetable C Compiler: Design and Implementation , by Christopher Fraser and David Hanson (c) 1995, Addison-Wesley.